Public contributions, comments and questions can be posted here: http://www.imsglobal.org/community/forum/categories.cfm?catid=110. 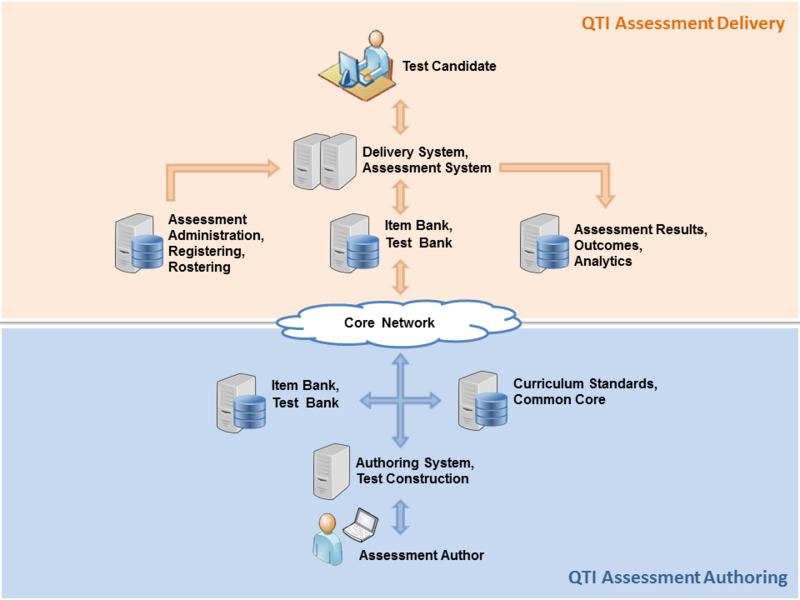 The IMS Question & Test Interoperability (QTI®) specification describes a data model for the representation of question (assessmentItem) and test (assessmentTest) data and their corresponding results reports. Therefore, the specification enables the exchange of this item, test and results data between authoring tools, item banks, test constructional tools, learning platforms and assessment delivery systems. The data model is described abstractly, using [UML] to facilitate binding to a wide range of data-modelling tools and programming languages; however, for interchange between systems a binding is provided to the industry standard eXtensible Markup Language [XML] and use of this binding is strongly recommended. The IMS QTI specification has been designed to support both interoperability and innovation through the provision of well-defined extension points. These extension points can be used to wrap specialized or proprietary data in ways that allow it to be used alongside items that can be represented directly. An initial V0.5 specification was released for discussion in March 1999 and in November it was agreed to develop IMS Question & Test Interoperability v1.0 which was released as a public draft in February 2000 and as a final specification in May that year. The specification was extended and updated twice, in March 2001 and January 2002. By February of that year in excess of 6000 copies of the IMS QTI 1.x specifications had been downloaded from the IMS website. Since then, a number of issues of have been raised by implementers and reviewed by the QTI project team. Many of them were dealt with in an addendum, which defined version 1.2.1 of the specification and was released in March 2003. Some of the issues could not be dealt with this way as they required changes to the specification that would not be backwardly compatible or because they uncovered more fundamental issues that would require extensive clarification or significant extension of the specification to resolve. Since the QTI specification was first conceived, the breadth of IMS specifications has grown and work on Content Packaging, Simple Sequencing and most recently Learning Design created the need for a cross-specification review. This review took place during 2003 and a number of harmonization issues affecting QTI were identified. In September that year a project charter was agreed to address both the collected issues from 1.x and the harmonization issues and to draft QTI V2.0. In order to make the work manageable and ensure that results were returned to the community at the earliest opportunity some restrictions were placed on the scope of the recommended work. Therefore, the QTI V2.0 release of the specification concentrated only on the individual assessmentItem and did not update those parts of the specification that dealt with the aggregation of items into sections and tests or the reporting of results. This QTI 2.1 release completes the update from 1.x to 2.x by replacing those remaining parts of the QTI specification. The IMS QTI work specifically relates to content providers (that is, question and test authors and publishers), developers of authoring and content management tools, assessment delivery systems and learning systems. The data model for representing question-based content is suitable for targeting users in learning, education and training across all age ranges and national contexts. QTI is designed to facilitate interoperability between a number of systems that are described here in relation to the actors that use them. Provide a well documented content format for storing and exchanging items independent of the authoring tool used to create them. Support the deployment of item banks across a wide range of learning and assessment delivery systems. Provide a well documented content format for storing and exchanging tests independent of the test construction tool used to create them. Support the deployment of items, item banks and tests from diverse sources in a single learning or assessment delivery system. Provide systems with the ability to report test results in a consistent manner. Figure 2.1 The Role of Assessment Tests and Assessment Items. A system used by an author for creating or modifying an assessment item. A system for collecting and managing collections of assessment items. A system for assembling tests from individual items. A system for managing the delivery of assessments to candidates. The system contains a delivery engine for delivering the items to the candidates and scores the responses automatically (where applicable) or by distributing them to scorers. A system that enables or directs learners in learning activities, possibly coordinated with a tutor. For the purposes of this specification a learner exposed to an assessment item as part of an interaction with a learning system (i.e., through formative assessment) is still described as a candidate as no formal distinction between formative and summative assessment is made. A learning system is also considered to contain a delivery engine though the administration and security model is likely to be very different from that employed by a DeliverySystem. The set of roles identified in this specification have been reduced to a small set of abstract actors for simplicity. Typically roles in real learning and assessment systems are more complex but, for the purposes of this specification, it is assumed that they can be generalized by one or more of the roles defined here. The author of an assessment item. In simple situations an item may have a single author, in more complex situations an item may go through a creation and quality control process involving many people. In this specification we identify all of these people with the role of author. An author is concerned with the content of an item, which distinguishes them from the role of an itemBankManager. An author interacts with an item through an authoringTool. An actor with responsibility for managing a collection of assessment items with an itemBank. The role of test constructor is to create tests (test forms) from individual items. The items are typically drawn from an item bank. A person charged with overseeing the delivery of an assessment. Often referred to as an invigilator. For the purposes of this specification a proctor is anyone (other than the candidate) who is involved in the delivery process but who does not have a role in assessing the candidate's responses. A person or external system responsible for assessing the candidate's responses during assessment delivery. Scorers are optional, for example, many assessment items can be scored automatically using response processing rules defined in the item itself. Someone involved in managing, directing or supporting the learning process for a learner but who is not subject to (the same) assessment. The person being assessed by an assessment test or assessment item. Implementation Guide: A document that takes you through the data models by example. The best starting point for readers who are new to QTI and want to get an idea of what it can do. Assessment Test, Section and Item Information Model: The reference guide to the main data model for assessment tests and items. The document provides detailed information about the model and specifies the requirements of delivery engines and authoring systems. Assessment Test, Section and Item Binding: A document describing the way the data models have been bound to [XML]. HTML5 Information Model and Binding: A document that describes the use of HTML5 elements and attributes allowed in the QTIv2.2 specification. Metadata Information Model and Binding: A document that describes a profile of the IEEE Standard for Learning Object Metadata [LOM] data model suitable for use with assessment tests and items and a separate data model for representing usage data (i.e., item statistics). This document will be of particular interest to developers and managers of item banks and other content repositories, and to those who construct assessments from item banks. Results Reporting Information Model and Binding: A reference guide to the data model for result reporting. The document provides detailed information about the model and specifies the associated requirements on delivery engines. Usage Data Information Model and Binding: A document that describes reporting statistical information about the usage of a set of items. Note: the Integration Guide and Migration Guide documents are not included in this QTI v2.2 update. The Integration Guide contains information about other related specifications such as as IMS Content Packaging [IMS_CP], IMS Simple Sequencing [IMS_SS] and IMS Learning Design [IMS_LD]; the Content Packaging information is now included in the Assessment Test, Section and Item Information Model document. The Migration Guide contains information primarily relevant to systems moving from QTI v1.x to QTI v2 and remains pertinent as described in the QTI v2.1 document. Because the QTI 2.x specification is designed to accommodate a wide range of practices, conformance is defined in, and tested against, specific profiles. Such a profile can define which parts of the specification a community intends to support (items, tests, packages, results), and what specific features in each of those areas. In some cases, profiles can also include extensions to the specification, which are outlined in further detail below. The current set of available profiles is available on the IMS website [QTI_APIP]. A certification of conformance against an existing profile is granted by passing a series of tests, submitting the results to IMS Global and agreeing to become part of the support community [QTI_APIP]. IMS records all certifications of conformance to current profiles on the public IMS certification website [IMS_CERT]. At the time conformance is certified, IMS issues a unique registration number designator for the product name and version for use in proposals. Buyers and users are invited to visit the certification website to find certified products and to log any issues with certified products. Communities that are interested in defining their own profiles are encouraged to examine current profiles for appropriateness or for inspiration. Contact IMS Global for the possibilities of adopting, adapting or defining a profile of QTI to meet the requirements of your particular community. Details about conformance related to both QTI and [APIP] are available on [ASSESS_PRIMER]. One of these is the QTI Formative Entry profile, which captures the same assessment requirements represented in Common Cartridge v1.x (based on a profile of the QTI v1.2 specification). Interoperability with this profile was demonstrated by systems involved in the development of the v2.1 specification. The IMS QTI/APIP Assessment APMG (Accredited Profile Management Group) is responsible for the ongoing maintenance of the QTI and APIP specifications, as well as those profiles that are available for conformance certification. QTI 2.x can be extended in two ways: with Custom Interactions and Custom Operators. Custom operators are a means of introducing more sophisticated processing of candidate's responses. This is particularly useful where the responses are likely to contain subject specific constructs such as computer code fragments or mathematical expressions. Further information and guidance on using custom operators is available in section 3.4.1 of the Implementation Guide of this specification. Custom Interactions are a means of using interaction types that are not covered by the interaction types of the specification itself. These custom interactions trade a degree of interoperability for a wider range of user experiences. Because of the interoperability cost, care should be taken in defining such custom interaction types, since they may well be covered by a particular configuration of an already existing interaction type. More information and best practice about sharing and running custom interactions is available at [INTERACT]. Work is underway to make types of portable custom interactions 'runnable', and therefore interoperable and sharable. More information will be made available at [INTERACT] in due course. Custom operators and custom interactions can be shared by registering them at [QTI_INPUT]; already registered custom extensions can be viewed at [QTI_REG]. The [QTI_INPUT] form requires the submitter to specify the title of the submitted custom extension, a short description, a schema (XSD or DTD) that defines the structure of the custom item, and the name and organization of the author of the custom extension. The name and affiliation of the submitter is automatically recorded. Optionally, the submission can include images, long descriptions, the name of a tool that implements the custom extension, and a website URL where more information about the tool and/or the custom extension is available. If and when there is a next revision of the QTI specification, the IMS QTI/APIP Assessment APMG will automatically take the custom extension into consideration for inclusion in the specification. In that case, the workgroup will contact the original submitter. In the cases where a vocabulary is rejected, then an explanation will be given for the rejection. An amended vocabulary can be resubmitted and this will be treated without prejudice. The list below summarizes the major changes and additions made to QTI between v2.1 and this version (2.2). More information about these changes is available to eAssessment Alliance members in the Summary of Changes document in the eAssessment Alliance. This document provides an overview of the QTI specification. This document has been approved by the IMS Technical Advisory Board and is made available for adoption and conformance. The first version of the QTI v2.1 specification. The Public Draft v2.1 of the QTI specification. The Public Draft v2.1 (revision 2) of the QTI specification. The Final Release v2.1 of the QTI specification. Includes updates, error corrections, and additional details. The Final v2.2 introduces new features and functionality to include for assessment and accessibility. IMS Global Learning Consortium, Inc. ("IMS Global") is publishing the information contained in this IMS Question and Test Interoperability Overview ("Specification") for purposes of scientific, experimental, and scholarly collaboration only.